Creation Ministries defend the authority of Scripture. Watch this defence of the Trinity; Richard Fangrad and Calvin Smith do a great job of defending and explaining the Trinity. 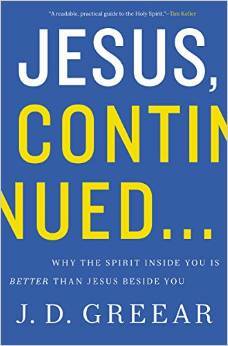 In his book and in this video Pastor Jason Greear explains how any follower of Jesus can have a satisfying, powerful relationship with God through the Holy Spirit. Whilst Dr Walter Wilson was saved December 21st, 1896, he did not personally become acquainted with the Holy Spirit until January 14th, 1914. After he was saved, Walter had a deep love for the scriptures yet it bothered him that his life did not seem to bear spiritual fruit. In 1913 he was challenged by a missionary with the question “What is the Holy Spirit to you?” Wilson answered “He is one of the persons of the Godhead, a Teacher, a Guide; the third person of the trinity”. Gray asked, “Have you noticed that this verse does not tell us to whom we should give our bodies? It is not the Lord Jesus…..He has his own body. It is not God the Father….He remains upon His throne. Another has come to earth without a body….God gives you the privilege and indescribable honour of presenting your bodies to the Holy Spirit, to be His dwelling place on earth”. Wilson reported later that he said to the Holy Spirit, “My Lord, I have mistreated You all my Christian life. I have treated you like a servant….I shall do so NO more. Now I give you this body of mine ; from my head to my feet……………., I hand over to YOU for YOU to live in it the life that YOU please. Walter Wilson , the “beloved physician” often testified, “With regard to my own experience with the Holy Spirit, I may say that the transformation in my life on JAN 14th 1914, was greater , much greater than the change that took place when I was saved DEC 21st 1896. Dr Wilson died in 1969 after a life of amazing service as a physician (1904 – 1912), General Manager (1912 – 1920) and then President (1926 -1928) of a major corporation. He founded the Kansas City Bible Institute in 1932 which became the Kansas City Bible College when he became President. He hosted a daily Bible exposition broadcast on two radio stations in Kansas City 1933-1944, one rated the most popular radio program in the area. But above all he considered Holy Spirit guided “soul winning” his prime task since handing over his life to the guidance of the Holy Spirit in 1914. Without the cross of JESUS CHRIST the world has NO foundation for affirming moral absolutes, for calling corruption by its name – SIN. The cross of Christ is also the only available force that can withstand and push back the storm of moral relativism that is upon us. Thanks to the cross of JESUS, we have a firm basis – empirical, historical and philosophical for affirming moral absolutes without the same moral law condemning us. The cross does not just provide a philosophical framework for moral absolutes. It also provides the WAY to deliver us from SIN. By the cross GOD shows us that the power He wants us to have is not the power to Lord it over others, not power to exploit and oppress, but power to sacrifice ourselves for others. Of course, God knows we can’t do this in our own strength so He sends the third person of the Trinity, Holy Spirit to indwell all believers. The transformation of the disciples at Pentecost when the Holy Spirit descended upon them in power is the same power available to Christians today. They were able to disregard the threats of the Jewish leaders, rejoice in persecution and deliberately chose to disregard the state and continue preaching JESUS. This is real evangelism. The author of Truth and Transformation, Vishal Mangalwadi described by Christianity Today as India’s foremost Christian intellectual is authentic. Vishal has spent time in jail in India for civil disobedience in helping the lowest caste, Dalits. He has planted churches there, is an international lecturer, social reformer, political columnist and author of fourteen books. 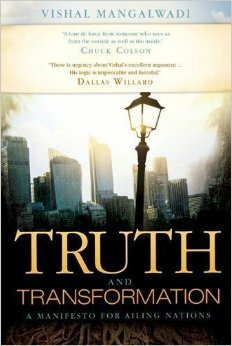 Truth and Transformation is a must read for anyone concerned with the state of current world events. I like Vishal’s explanation for the rational cynicism that has now become the hallmark of secular universities. “The west has exchanged its worldview shaped by the Bible for a lie that the human mind is an accident of blind chance, no more valid than an animal brain”. Remember most of the prestigious universities in the UK and USA commenced as Christian Institutions, e.g. Oxford and Harvard. The Tri-une nature of God is the foundation for human thinking and feeling. Jonathan Edwards, one of America’s greatest thinkers and theologians in “An Essay on the Trinity” from “Treatise on Grace and Other Posthumously Published Writings” (Cambridge UK 1971) provides a remarkable description of how the three persons of the trinity relate to each other. Summary: The Father is God existing in the primal, unoriginated, most absolute manner. God the Son stands forth eternally as a work of God’s THOUGHT (thinking). And God the Holy Spirit proceeds from the Father and the Son as an act of their JOY (feeling). They are co-eternal and equally divine. Also John Piper in his book “Think” says it well: God’s existence as a Trinity of Persons is the foundation of human nature as head and heart, thinking and feeling, knowing and loving. God’s “thinking” and “feeling” are deeply part of His Trinitarian being. God made the world so He can communicate, and we his creatures receive, His glory; and that it might be received by both the mind and heart. If we are to live as people made in the image of God to glorify Him fully, we must engage our mind in knowing Him truly and our hearts in loving Him duly. The mind serves to know the truth that fuels the fire of the heart. This is the best visual I have seen on the TRINITY. 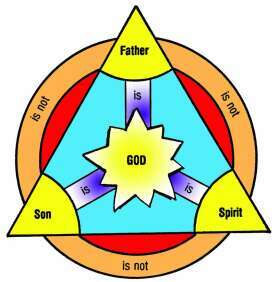 It shows clearly that the TRINITY comprises three persons. I was guilty of not treating the Holy Spirit as a person, the third person of the TRINITY who indwelt my spirit and was prepared to be my Counsellor, Comforter, Teacher and even Healer. You need to develop a relationship with the HOLY SPIRIT which takes time and effort. The scripture cautions us strongly about not grieving or quenching the work of the Holy Spirit in our lives.